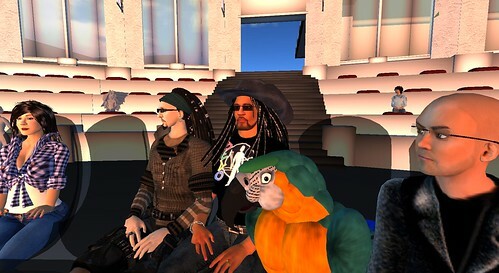 In a Strange Land: SL Educators' Roundtable Tuesday: Adult Content! Next Tuesday, the "Linden Tour" will bring Claudia, George, and Pathfinder Linden to Montclair State University, where they will talk (via voice) about the changes in zoning that will soon irrevocably change the SL experience. "PG is going to be almost a special use case used by educators and real world businesses," they believe, while "the vast middle ground" of Second Life will be rated Mature. I don't think educators are primarily responsible for this, but that's a gut reaction. In fact, at the Lindens' e-list for educators, I detected the opposite, a libertarian impulse to say and do what one pleased. For instance, when I questioned an educator who is very active in Gorean roleplay why she does not use an alt for her adventures, she explained that while her educational work and hobby are two separate worlds, she'd not hide it with an alt or in her avatar's profile. She is proud of the Gorean lifestyle. It's a matter of creative freedom for her. Others have noted that their administrators do not look so kindly on adult activity, even "gaming" on the computers they house on campus. I can only imagine the reaction were such admins to find that a faculty member or, worse for the employee, a nontenured staff member were a slave or Gorean master in SL. I'll be most curious to see what the Lindens say, and I'll post a synopsis here along with links to the full chat-transcript.